Good morning, all! 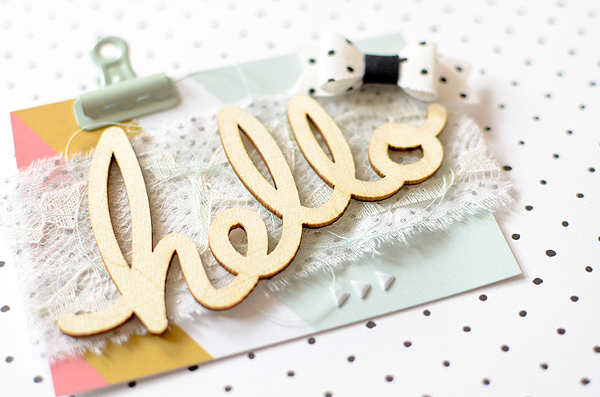 It's the 15th which means a new Gossamer Blue Inspiration Blog Hop. I haven't been able to participate with a post in a few months, so I'm really excited to be back in! 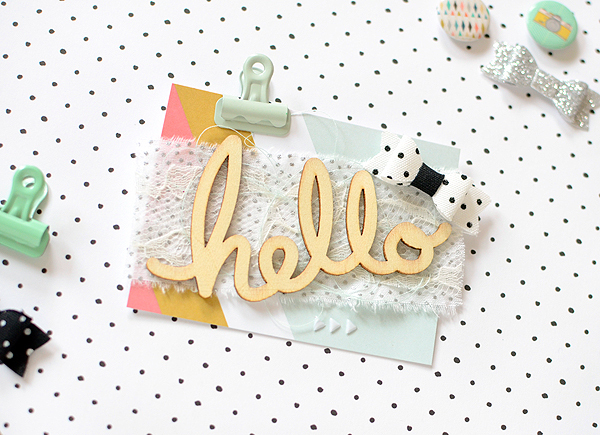 I know the other gals will have some awesome projects to share today--they always do ;) If you're here from Patricia's lovely blog, welcome! I ended up making a lot of tags this month. The Life Pages cards, which I often use my tag base, were so good and I got a bit carried away and made a whole bunch. There might even be a couple of unfinished ones sitting on my desk, hoping for a free block of time so I might finish them! 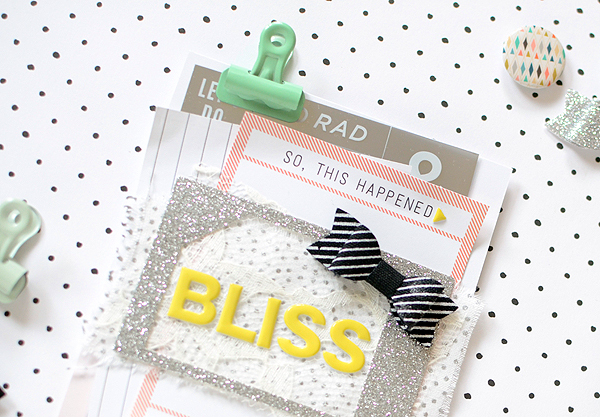 I really wanted to make this tag bright and fun, with lots of happy words. 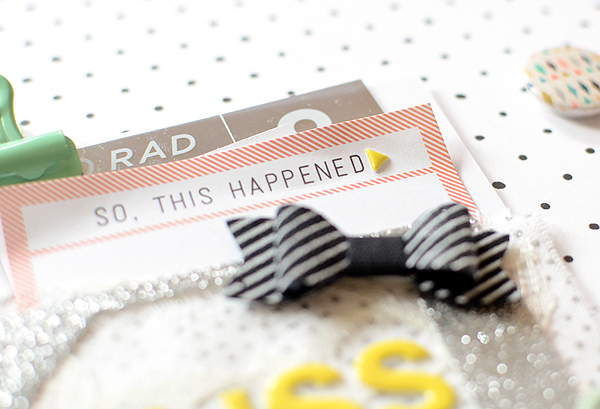 The orange stripes on the 'So this happened' card are just the kind of design I look for when choosing my tag elements. There's a lot of white, with an interesting pattern, and a nonspecific phrase. Being that they are likely intended to go in someone's pocket page album, certain phrases don't always work for cards and tags. So I generally gravitate to the ones that are more generic; like this one. I adore this color combination--yellow, orange, mint, and silver. 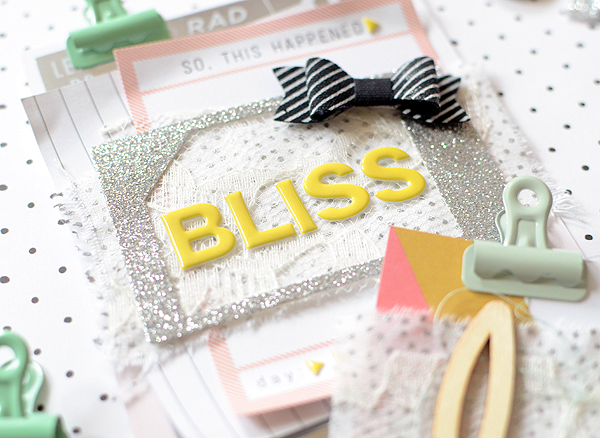 The word 'BLISS' is from the Fancy Pants puffy sticker sheet and the shade of yellow is gorgeous! I backed the silver glitter frame with swatches of white lace on top of metallic silver dotted fabric. It's very similar to the technique I used on the mini card in yesterday's post, showcasing another of my February GB projects. Doing that adds much-needed texture and keeps the eye moving. I chose another tip-top LP card to begin my second tag. This card had no sentiment, just great colors and lines. I used more lace and the same polka dot fabric, but added a web of messy mint thread before I adhered the wood "HELLO" to the lace. A couple of easy extra details like the bow and the tiny white puffy triangle stickers completed the tag. 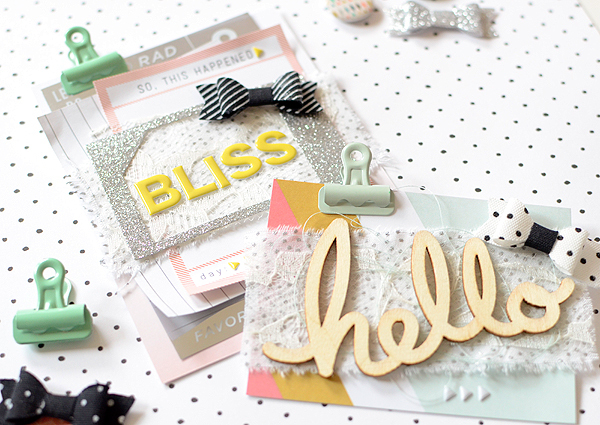 To match the first tag, I used the lighter mint metal clip; it's a near-perfect match to the aqua-mint on the card. Thanks for coming by on what I hope is a blissful Monday for you...Sandra Dietrich is your next stop and I know you won't be disappointed there! You can still find a few kits left so check out the GB store soon, before they sell out! Better yet, start a subscription if you haven't already. ---> Rebecca Luminarias <--- That's me! These absolutely ROCK, I love what you've done!